I am posting this in hopes that someone will see it and know where I might find the dataset I am looking for. 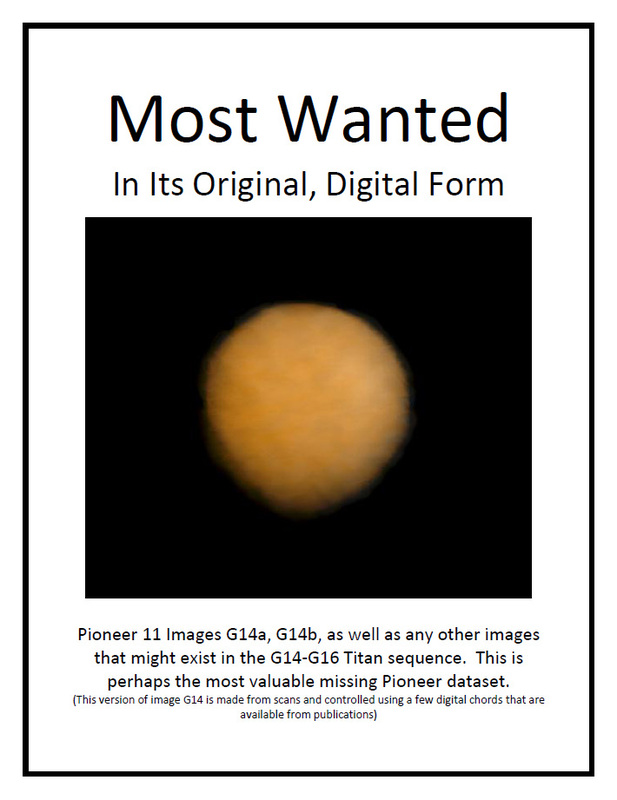 The image of Titan seen here is image G14. It is the best of a sequence that included G15 and G16 (for each number, there are two images, a red channel image and a blue channel image). 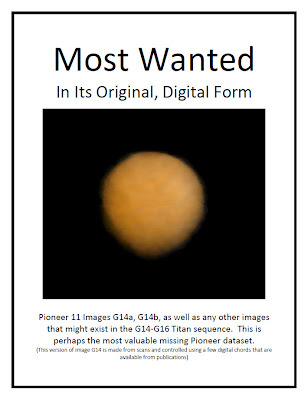 If any of you have or know where I could find these (or any other Pioneer images) images in their native digital format (probably in the form of a printed out matrix), please let me know. While I'm at it, here is how the image looks with both channels separated and without any processing. Again, what I am looking for is the digital data, not a better source to scan. While I'm on the subject of Pioneer 10 and 11, here is the abstract I submitted for the Lunar and Planetary Science Conference (which I will be attending this week). http://www.lpi.usra.edu/meetings/lpsc2011/pdf/1267.pdf It was written before my visit to Ames Research Center in January. I did find some better material to scan and some fragments, but I did not find the digital data I had hoped to. The most useful projects will likely be a high resolution mosaic using the closeup data from Pioneer 11 as it passed over Jupiter's North Pole and a sequence (perhaps to be made into a movie) of Jupiter rotating from above the North Pole as Pioneer 11 receded. Here is the poster I am presenting, which is a combination of older work and very preliminary processing. G. Pioneer 11 image D7 (Io) Digital. 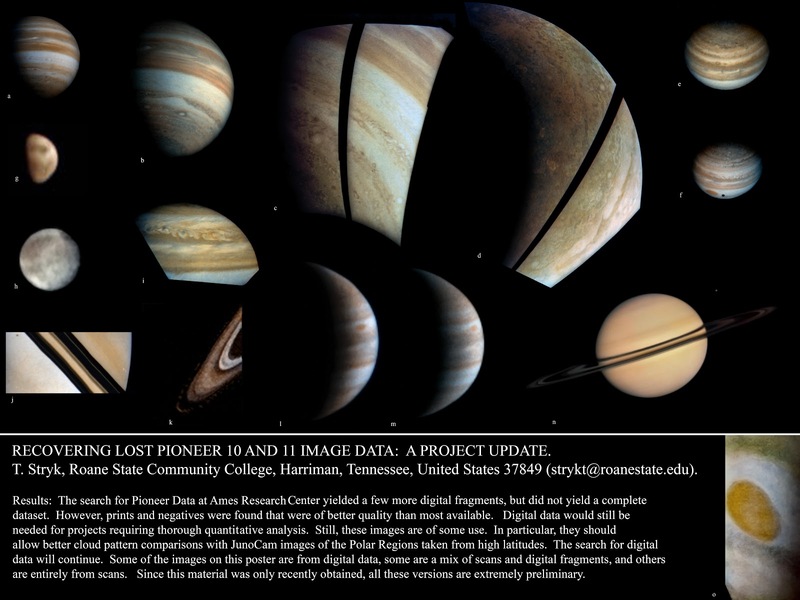 N. Pioneer 11 mosaic using data from images F33, F19, and F12-F5 (Saturn) Mix of digital data and scans. Scanned material and raw data courtesy NASA/Ames Research Center. Processed images Copyright Ted Stryk. Try asking in the unmannedspaceflight.com forums. I have tried unmannedspaceflight.com, the NSSDC, Ames, and contacting people involved with the instrument...so far little luck (everyone has been very helpful, but no one has what I am looking for or knows where to find it). Thanks anyway! Maybe the USGS in Flagstaff. They had a roomful of 9 track tapes from various missions when I was there as a summer student in 1980 and 81. 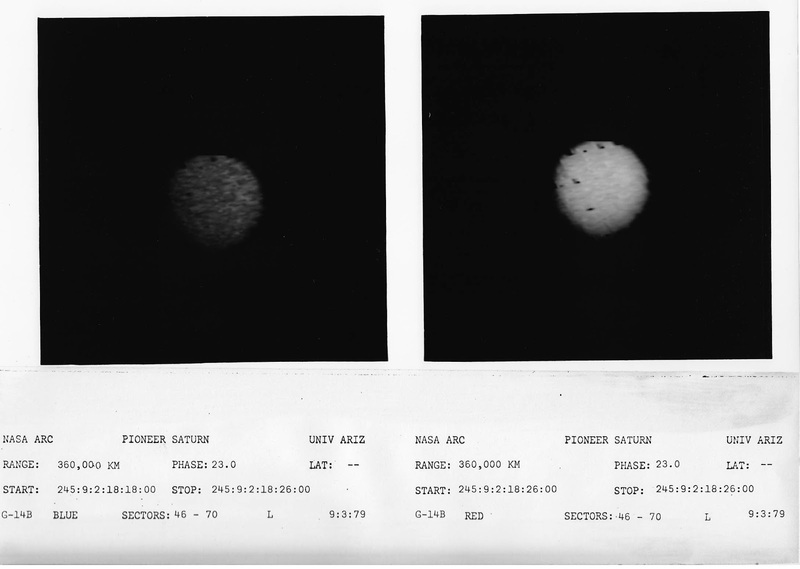 They were processing Voyager images, but there were a lot of tapes from older missions.